Asia has made significant gains in women’s rights and equality, but there is more to be done. In 1994, something remarkable happened at the International Conference on Population and Development (ICPD) in Cairo. After years of often heated negotiations, 179 governments agreed on a Programme of Action that, for the first time, placed individual dignity and human rights firmly at the heart of human development. It did so by reconciling widely divergent views on population and development, gender equality, sexual and reproductive health, and sustainable development – to empower individuals and, by extension, entire societies and nations. A core component of ICPD is universal access to sexual and reproductive health. Women must be able to shape their lives through access to rights-based family planning, including modern contraception and skilled birth attendance – ensuring that every pregnancy is wanted and every childbirth is safe. Without this we cannot achieve women’s empowerment, including their economic empowerment. For young persons, ICPD refers to the components now included in comprehensive sexuality education, providing accurate and timely information on issues that go beyond sexual and reproductive health to embrace gender equality and a respect for diversity, establishing a solid foundation for life. For all countries, ICPD underscores the importance of robust data for development, gathered through censuses and other mechanisms, providing governments with accurate representations of their populations, forecasting demographic patterns such as the youth bulge and ageing populations, enabling countries to capitalise on opportunities and plan better for challenges. Truly revolutionary at the time, ICPD remains all the more urgent a quarter of a century later in this era of the 2030 Agenda for Sustainable Development and its Sustainable Development Goals (SDGs) – and, ironically, at a time of growing conservatism around the world. Many long-time ICPD champions are changing course. Hard-won individual rights and freedoms are being curtailed. Censuses and data gathering are being politicised, with vulnerable populations disenfranchised in the process. In this environment, Asia-Pacific governments gathered last week at the United Nations regional hub in Bangkok – to take stock of how far we’ve come in achieving ICPD, especially in the context of the 2030 Agenda. • in improving maternal health and reducing preventable maternal deaths? • in strengthening women’s right to choose when or whether to get married, when or whether to have children, and how many? • in eliminating violence and harmful practices against women and girls? • in providing young people optimal opportunities to achieve their full potential? • in planning for a rapidly ageing Asia-Pacific region, to ensure the well-being of older people, allowing them to contribute for as long as they are able? Governments agreed that while significant gains have been made under ICPD, progress cannot be taken for granted. 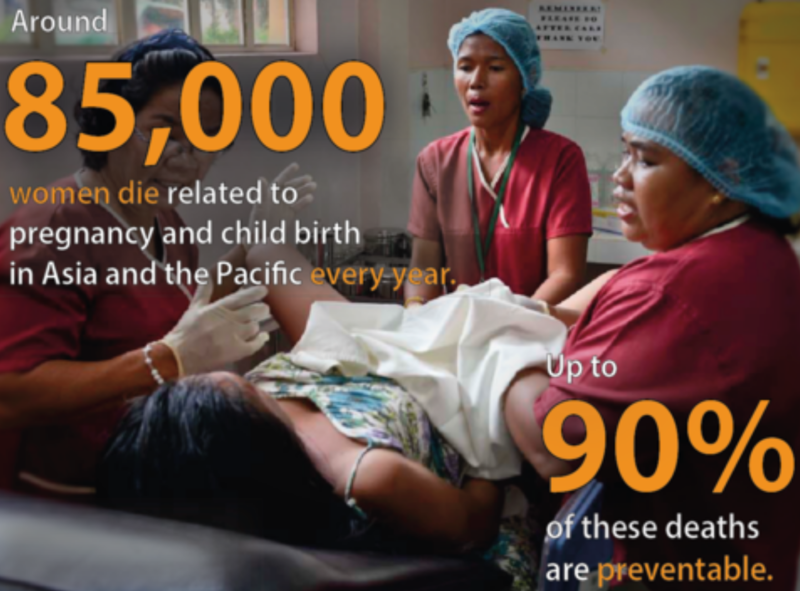 Maternal mortality remains high: 85,000 women in Asia-Pacific died while giving birth in 2015. And, last year, an estimated 132 million women in the region had an unmet need for contraception. While many countries have adopted laws, national policies and action plans on gender equality and eliminating violence against women and girls, 15-68% of women in Asia-Pacific have experienced physical and/or sexual violence at the hands of a partner in their lifetime. Rates of child marriage and teenage pregnancy also remain high. By the age of 18, one in seven girls in the region has given birth, and more than one third of girls are married. Women’s labour force participation has stalled in our region, and in South Asia it has actually fallen over the past decade. Women remain concentrated in informal employment and continue to have primary responsibility for unpaid care work. These trends are closely inter-related. Globally, women’s labour force participation decreases with each additional child by around 10-15% among women aged 25-39. Unintended pregnancy constrains opportunities for education and economic advancement for women and girls. Violence against women leads to higher health costs, lost days at work, and lost income. The estimated economic cost of gender-based violence runs from 1.2-3.7% of GDP – similar to what many countries spend on education. In last week’s review, governments acknowledged that these challenges won’t be adequately addressed unless women’s rights are significantly expanded – supported by stronger laws and mechanisms, and with more women in decision-making positions, including in parliaments and legislatures. The need for comprehensive youth policies that are truly inclusive, giving young people a genuine voice in shaping their futures, was also recognised. As was universal access to sexual and reproductive health services, including voluntary family planning, and eliminating all forms of discrimination. In listing these and other gaps that need to be bridged, governments reiterated that without ICPD, we would not have the SDGs. The Programme of Action is truly integral to the 2030 Agenda. Similarly, without fulfilling ICPD, we will not achieve the SDGs, whose ultimate pledge is to leave no one behind. For Asia-Pacific and the world, we cannot afford to fail.